Sellers will soon be unable to list used cribs on eBay's U.S. site, as eBay has agreed to stop the sale of used cribs to prevent faulty ones from entering homes and endangering children. This temporary ban comes after a review of Web sites showed cribs that didn't comply with new federal safety regulations are still being sold on multiple sites, including eBay and Craigslist. The eBay ban will only last "until a time when used cribs meet the new standards" that were approved on June 28, notes the U.S. Consumer Product Safety Commission on its Twitter account. "eBay and CPSC want all babies to have the safest sleep environment possible," adds Amanda Coffee, a spokeswoman for eBay. "In support of CPSC's new, tough crib safety standards, eBay has taken proactive steps to alert all users of its ban on listings of drop-side cribs and all other crib listings that violate the new safety rules." According to the new federal safely regulations, all cribs made and sold—this includes resale—after June 28 must have better slat strength, more durable mattress supports and stronger hardware than previous models. Regular testing is also required, and cribs with drop sides cannot be made or sold, the CPSC reports. According to news reports, in the last year, these cribs killed 32 children because of malfunctions. 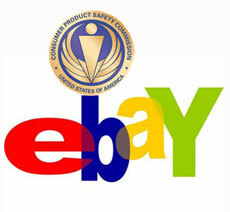 eBay's "action plan will be implemented in the next few weeks, and will last for a set period of time," Coffee says. However, she did not mention specific dates or time frames. Experienced sellers say the answer often comes from what you know and love.